The US Federal Reserve met yesterday to discuss whether or not to increase interest rates in the US – something which would have had a significant impact upon global investment. Interest rates in the US have remained unchanged for many years save for a for the first hike since in December last year. The decision by the US Federal Reserve to maintain the *federal funds rate target was in line with the consensus. 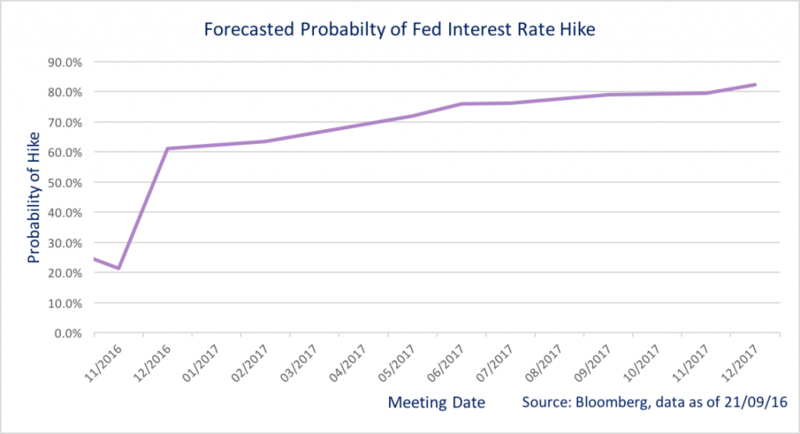 Looking back earlier in September, it was noted that there was only 22% forecasted probability in favour of a hike at the September meeting. It is now clear that the target is unchanged at 0.25% to 0.5%. For many the situation is like the Curate’s Egg, good in parts. The Fed said “the case for an increase…has strengthened” With a split panel, whereby three members of the twelve voted in favour of a rise, there is just speculation that the Federal Reserve is on the cusp of a vote in favour of a hike in future scheduled meetings. Forecasts for the longer term continue along a path of a very modest interest rate hiking cycle. When considering their verdict, the Fed make judgments which take account of the impact their decisions have on financial markets and how this transmits back into the economy, both home and abroad. In other words, they are tasked with making some difficult choices to avoid unsettling the ongoing economic recovery. The decision to remain steady at the current interest rate indicated the Fed’s inclination to continue the stimulation of the US economy. This acts as a growth boosting effort for the US economy. In the immediate aftermath, investors have been bolstered by this decision as it is reported that stocks rose around the world, reflecting the continued stimulus from Central Banks. There are two more meetings to take place this year, on 1st – 2nd November and 13th – 14th December, and expectations are showing a 21.4% and 61.2% probability of a hike, respectively. Most forecasters favour a change taking place in December. As we keep our eyes on the world, we are further reminded of the globally-connected world we live in. As investment professionals, we have long been championing the message of adequate diversification when considering an investment solution. Reducing risk presented by any one asset, geographical area or investment style, could be a way to navigate through short-term negative events. *The interest rate at which a depository institution lends funds maintained at the Federal Reserve to another depository institution overnight.